BRECKENRIDGE was laid out in the fall of 1856. The town was named after John C. Breckenridge who was a leading Democrat of Kentucky at the time and later became the Vice President of the United States with President James Buchanan. 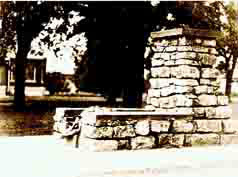 In 1858 the building of the Hannibal and St. Joseph Railroad began immigration into this area. The northeastern part of the township a little south of the Town of Breckenridge became known as "New Kentucky" from its fancied or real resemblance to certain portions of the blue grass region of Kentucky. The new Hannibal and St. Joseph railroad at that time was working from the two terminals. The eastern end reached Breckenridge late in 1858 and for a few months, due to a delay on the western end, Breckenridge stood at the end of the railroad. This accounted for an influx of industry and growth. Today, the railroad heritage is only a memory. 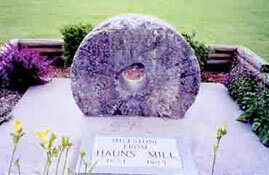 One of the tourist attractions for this city is the Haun's Millstone Monument in honor of the early Mormon saints which is found in Breckenridge City Park.